When King Lear was performed in 1605, audiences would have been interested in the themes Shakespeare presented, such as inheritance, family bonds, and the dangers of combining self-interest with power. A modern audience would also be interested in the sibling rivalry, a common feature among families today. Particularly fascinated by this aspect of the play, I have decided to look at how Shakespeare presents the unattractive nature of Goneril and Regan’s relationship. In Act 1, Scene 1 Lear devises a love game to see “Which of you shall we say doth love us most?” to justify who receives the most opulent share of land. Shakespeare shows the strategic minds of Goneril and Regan, who know what Lear’s plan is. Although his division of the land had already been decided, this was the formal statement. Goneril and Regan both know that if they do not flatter Lear they may lose land; therefore, they seem to have already carefully planned an answer to compete against one another. This rivalry presents the sisters in a somewhat childish game, each trying to outdo the other. Shakespeare is foreshadowing future competition between them and signalling “Who covers faults, at last shame them derides,” which perhaps gives a sense of hope, for whatever injustices they perform, they will be the ones laughed at in the end. 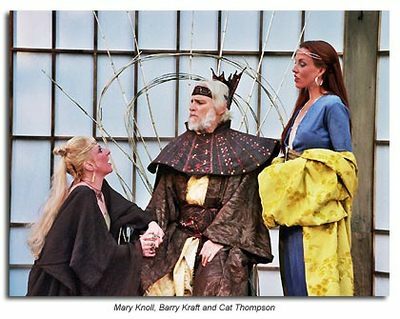 However, at the end of this first scene, after both earning their land, the sisters join together and converse about how to put Lear in his place. Shakespeare presents Goneril as the more dominant sister in this section as the instigator of the conversation, she being the one who suggests “Pray you let’s hit /together;” while they deal with the matter of their father, but you can see they are still wary of one another. Even when they come side by side to help one another, it is a very cold moment, as if they were soldiers preparing strategies for battle, not sisters alerting the audience to the kind of people they are. Later (Act 1, Scene 3) we see Goneril engineering a confrontation with her father, telling Oswald to “Put on what weary negligence you please”. 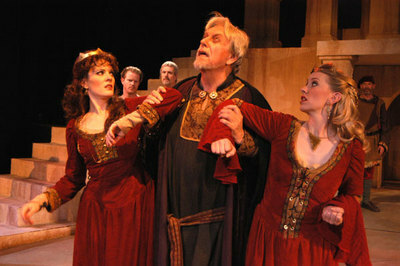 Then (Scene 4) Lear returns from hunting and Goneril follows through with the plan. She purposefully arrives late to greet him so as to annoy Lear, who still expects to be waited on hand and foot. Oswald is rude to Lear, as ordered, when he replies to Lear’s inquiry as to whether he knows who he is with “My lady’s father”, instead of “the king”. It is in Goneril’s best interest to organise a confrontation with Lear because by getting him worked up, he starts acting rashly and leaves. When Goneril arrives, she complains about Lear’s train because they “Do hourly carp and quarrel,” At this point Shakespeare allows you to feel sympathy for her, because she has to deal with extra knights who are constantly bickering and breaking into fights. For this we only have Goneril’s word, and it is up to the director as to which tack to take. I believe it would be best acted out to show her telling the truth, so there is at least a legitimate reason for her complaints. Therefore, the audience can sympathise with Goneril when she begs Lear “a little to disquantity” his “train” (Act 1 Scene 4 231/232). This sounds like a reasonable request, but currently unknown to the audience, this is part of her plan to undermine him. This is why Goneril sends a letter to Regan informing her of what has taken place. We see how stoic Goneril really is when Lear starts calling on the goddess of nature to “into her womb convey sterility!” Her reaction to such perverse and violent language is very controlled and dismissive as she instructs Albany to “Never afflict yourself to know the cause.” Having seen two different film versions of King Lear, I can see the different stage choices that the directors made to present Goneril in this situation. Peter Brook stayed true to the script, having the actor completely passive towards Lear’s remarks. I liked this version because it was how I imagined her character. However, Richard Eyre had Goneril display great distress. 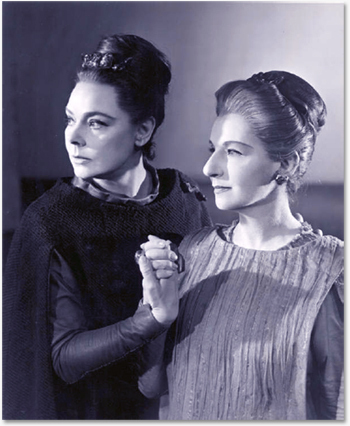 I also believe the actress overacted, detracting from the steely quality I imagined in Goneril. 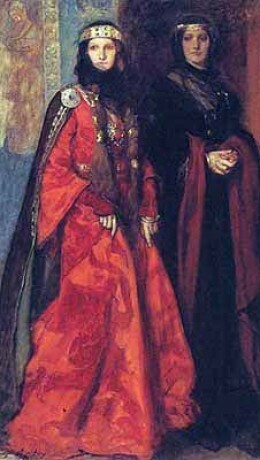 The relationship between the sisters develops further when Lear comes to meet Regan in Act 2, Scene 4. Whereas Goneril was very cold with her father, making it clear that she did not want him there by the tone of her language, Regan pretends to be “glad to see your highness…” However, Lear soon realises whose side Regan is on, after he complains about Goneril and she sticks up for her. “I cannot think my sister in the least /would fail her obligation.” The tone she would use is so innocent and non-accusatory – but at the same time formal and unyielding – that the audience can see the manipulative techniques Regan is using to enrage Lear. When Goneril joins them, she greets Regan warmly by the hand. The relationship between them here is at its strongest. They are both working together, warmer to each other than in any other part of the play. When they have a united front, it is shown that they are in the most powerful position. Shakespeare allows the audience to have mixed feelings at this point. At the beginning of the play, they would not have felt much compassion for Lear because he was a harsh and very rash man, but now they can see that Lear is a victim, whereas Goneril and Regan are clearly the malicious characters, manipulating his mind, and making it grow weaker. Then again, some audience members may feel sympathy for Regan for the same reasons they might have earlier for Goneril. Not only is looking after his knights a strain, but Lear is putting the sisters in a difficult position by still clinging onto the power that, only an act ago, he so blatantly gave away, leaving a power struggle to be dealt with. Lear believes “fifty doth yet double five and twenty/ and thou art twice her love” showing he is still equating love with material possessions rather than fond affection. Once Lear leaves, Regan says, “I’ll receive him gladly, /but not one follower,” because Shakespeare wants to show the audience how they justify their inhumane actions against Lear, locking him out into the storm where he could possibly die. This makes the audience feel repulsion towards their disgusting and self-justifying behaviour. By Act 3, Scene 7, we see a huge change in Goneril and Regan’s characters. They had both warned Gloucester not to offer Lear any hospitality, but he did not listen and thus convinced the King to head for Dover. Because of Gloucester’s perceived insolence they want to punish him. Regan wants to “hang him instantly,” Which would shock the audience, because it is the first sign that they are actually not just devious people, but killers too. The differences between the two sisters also becomes more marked. Where Goneril is apparently much more sadistic, wanting to take pleasure in torturing Gloucester in an unnecessarily gruesome way with the idea to “pluck out his eyes”, she actually leaves before the torture begins, and it is Regan who readily takes an active part in it, showing that she starts to become as violent as Goneril; she’s finished with subtle niceties and has become just plain cruel. Even though Regan first wanted him dead, she eventually lets him go, so he can suffer more because “One side will mock another;” later, she will find that this is her own undoing because Gloucester’s bandaged face will move all hearts against them. Though the sisters had “hit together” earlier, Shakespeare brings them back full circle becoming rivals once more; but in this case, their rivalry is not for land, but for love of Edmund, their equivalent evil counterpart in the subplot. The beginning of this rivalry starts (Act 2, Scene 4) before Gloucester’s blinding; Goneril says to Edmund, “A mistress’s command,” referring to herself as being Edmund’s military commander and perhaps his lover too, therefore getting personal feelings mixed up with political issues. The sexual connotations foreshadow Goneril’s speech after Gloucester’s blinding when she says “I must change arms at home and give distaff/ into my husband’s hands.” hinting to the audience that she plans on killing her husband and Edmund taking his place. Tension mounts when a messenger comes in with a letter from Regan bringing news of Cornwall’s death. Shakespeare, here allows Goneril to speak aside to the audience and articulate her anxiety that Regan “but being widow” would have the advantage in getting Edmund. This news has thwarted her ambitions to be with Edmund and if he does end up with Regan then her life would be one of misery, “May all the building in my fancy pluck/ upon my hateful life;” another example of how damaging it can be to let strong emotions interfere in the political sphere. While modern audiences would be able to relate to the rivalry here, Shakespeare relieves all the sympathy we might feel for the sisters by illustrating them in such a barbaric way. In Scene 5 we see another type of rivalry. It is only mentioned very briefly by Oswald to Regan that “Your sister is the better soldier,” but with jealousy running high between the two, suggestion of military superiority is sure to aggravate Regan further. Goneril’s fear of Regan taking Edmund away from her emulates Regan’s same fear of Goneril, when Oswald comes in with a letter from her to Edmund, shown by her constant attempt to “unseal the letter.” When he will not give it to her, she puts Oswald in the middle by telling him to “Give him this;” referring to a gift for Edmund. Shakespeare now gives the audience the chance to experience some sympathy for Oswald, but also to see his predicament as comical. In Act 5, Scene 1, Shakespeare gives Goneril’s character more overt emotion. When she speaks aside to the audience, they realise that she does have real emotions towards Edmund, for she would “rather lose the battle than that (her) sister /should loosen him…” However, an audience might realise this blind love for Edmund as dangerous in such a critical strategic moment. Regan meanwhile goes back to subtle niceties to get her way. She does not want her sister to be alone with Edmund and wants to keep an eye on everyone, so asks her “pray you, go with us.” But Goneril says “I know the riddle – I will go,” merely playing along. Scene 3 presents the jealousy between Goneril and Regan at its most extreme. We find out that Regan is not feeling well, and Goneril says with satisfaction to the audience “If not, I’ll ne’er trust medicine,” a euphemism for poison. Although we have seen her be cruel in the past, the audience is unlikely to expect her to go as far as killing her own sister, which is why Shakespeare was able to create surprise, exposing the deadly potential of jealousy. Not only do the effects of jealousy create drama, but also they also serve to teach the audience. Although it is a tragic play, it does show a type of justice when Shakespeare depicts that evil deeds do not pay off when Goneril stabs herself in despair after Edger fatally wounds Edmund. There is a small twinge of sympathy for the siblings when Edmund states how their love for him corrupted them and ended in their deaths, but this is short lived. The irony to this is that Goneril and Regan were the two most concerned with making themselves powerful, but end up being promptly forgotten when the audience are immediately confronted with the shocking picture of Lear carrying Cordelia, dead in his arms. Shakespeare’s presentation of Goneril and Regan has political significance. Their outrageously aggressive behaviour led to their eventual demise and that of others. Due to selfishness, jealousy and lust they brought havoc to their country. The sister’s relationship Shakespeare presents is one of jealousy, distrust and above all, selfishness; he shows how these features combined together can result in traumatic events not only on a personal, but on a much wider scale that affects everyone, emphasising the need for patience and kindness. Though increasingly stereotypical power-craving characters, there is an element of realism in their presentation, such as that of sibling rivalry in an extreme form.